In a completely different perspective from mere political deconstructing of the Palestinian-Israeli conflict, a psychological and religious one, Psychologist Susan Heitler, Ph.D. and Rabbi Howard Hoffman extend the boundaries by which we understand the conflict. Come and find out the perspective of two professionals as they discuss scapegoating. 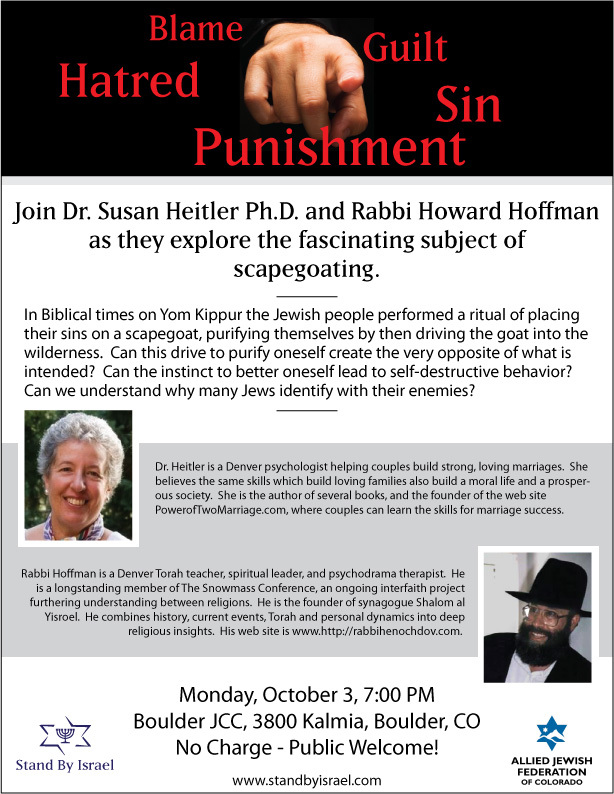 The event is this Monday, October 3rd at the Boulder Jewish Community Center, 3800 Kalmia, 7:00 P.M. The Stockholm Syndrome defines an emotional attachment hostages many times take to their captors, even defending them after the ordeal (think of a young Patty Hearst committing bank robbery as a voluntary member of the Symbionese Liberation Army, this after being captured by them from the midst of her wealthy life). Kenneth Levin, a psychiatrist who teaches at Harvard Medical School, used this idea in his 2005 book, “The Oslo Syndrome,” to describe the phenomenon of Jewish leaders and intellectuals irrationally subscribing to policies which are clearly, in his eyes, antithetical to their own well-being, perhaps even their lives. Sometimes the Jewish reaction to the hatred from the world toward Israel is to ask the question: what did we do or are we doing wrong that explains why Jews are under attack? 1. That those who oppose you may not be coming to you rationally in the first place (an older Holocaust Survivor was on the recent Turkish inspired Flotilla which included the Mavi Marmara). There are Jews who want to believe those who hate them and want to kill them. 2. An explanation of why this irrational behavior might be the case; what is the dynamic by which this phenomenon, the Oslo Syndrome, occurs? Are they, for instance, trying to find solace from a personal angst about hatred directed at them by anti-Semites? Just asking the question is tricky; even more so is any answer. This is a good time of the year, during Rosh Hashanah and Yom Kippur, to study and contemplate the question of, in the reverse of sending the sacrificial goat to the wilderness with our sins, Jews becoming the sacrificial goat instead, accepting the sins of the Palestinians and the Arabs as their sins. Do some Jews become moral relativists to justify behavior they think absolves them of being Jewish?